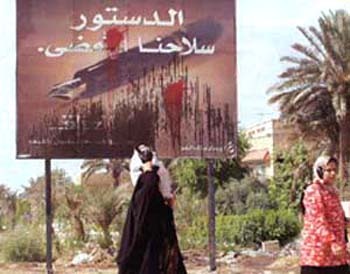 WAR AND PEACE IN PERSPECTIVE – The massive participation of the Iraqi people in the elections of January 30 and December 15, 2005 respectively for a provisory and a permanent parliament changed the situation in Iraq. It moved from the war stage to a transitory phase heading toward peace. The parliament will choose the president and prime minister, which will supposedly create a new leadership in the country, preventing a return to a dictatorship and the hegemony of Muslim clergy. • Terrorist groups in Iraq whose ranks are substantially swelled by terrorists from Syria, Saudi Arabia, Iran, Afghanistan, Pakistan, etc. These radical groups rightly reason that they have much to lose with the new model of government being established in Iraq and are concentrating efforts to impede its success. • Another source of violence is the Sunni insurgents, angry that their racial minority will lose its decades-old political and economic control over a Shiite majority and a Kurd minority. The Sunni area in central Iraq is quite poor. The richest resources of oil are in the northern Kurd or southern Shiite regions. The American media and the left are now clamoring for withdrawing US troops from Iraq for this or that sham reason. In fact, there are many inaccurate intepretations of the facts being offered. Let me enter the dispute with a pro-war argument that I have not yet seen developed, and present some evidence against the misinformation campaign of the media. For me one of the main reasons why the US is correct in waging this war on terrorism in Iraq is because today it is the last country in the world to uphold a sense of honor. Indeed, when Muslim terrorists attacked in New York and Washington, only the US had the courage to make a proportionate response. Facing an analogous danger, Canada did not support the American initiative. In Europe, France is subservient to the oil kings, furnishing them with its technology. There was no question whether France would support the US war in Iraq. The question was rather the opposite: whether France was supporting the previous regime in Iraq. But that friendly attitude didn't prevent an Arab arrogant agression. 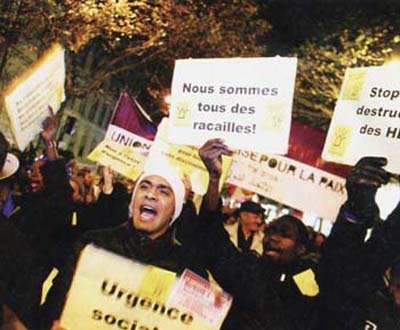 The recent riots in Paris and its environs put the French government on its knees before Islamism. In Germany, the situation to date is not essentially different from that in France. Spain supported the war and sent its troops to Iraq. But, as soon as Muslim terrorism exploded some trains in Madrid, Spain scuttled like a rabbit from the war. The Islamic invasion of Europe, caused by relaxed immigration laws on one hand and the demographic explosion of Muslim immigrants on the other, makes every European country weak in face of Islam. New citizens, the children of Muslim immigrants, have multiplied and acquired the potential force to threaten most European countries with the kind of riots and destruction that erupted in France. That is to say, it is most likely these countries will not react on the point of honor against Islamic terrorism. If you turn your eyes to South America, you find a continent that is rapidly becoming red. Venezuela, Brazil, Argentina, Uruguay and Bolivia are Communist countries whose politics are clearly anti-United States (click here). Last Sunday, Chile elected as president a woman, Michelle Bachelet, with Marxist ideas. She also has a record of past support for the former Marxist government of Salvador Allende (1970-1973) and links with the Chilean guerrilla movement MIR [Movimiento de Izquierda Revolucionaria - Movement of the Revolutionary Left]. Insofar as she shows more affinity with those social-political ideals, the Chilean Socialist alliances that have been governing the country for the past 15 years can change color from pink to red. Ecuador seems prepared to follow the steps of Bolivia, which also just elected a Communist, anti-US president. Peru is following the same path as Ecuador. Therefore, from South America the US can expect nothing but opposition to its effort against Muslim terrorism. Further, in May 2005 Brazil promoted a congress of 34 countries from South America, North Africa, and the Middle East trying to initiate an international Latin-America-Arab league turned against the US and its natural allies (click here). Its final declaration that spoke for the ensemble of nations criticized the US and pledged a new economic order turned against the rich countries. If you look at Central America, it is deeply marked by the presence of Cuba. The 2004 elections in Nicaragua gave the Sandinist Party (Communist) control over 91 of the 152 cities and 15 of the 17 capitals of provinces. Such results project a great probability that in the October 2006 presidential elections, the same party led by Daniel Ortega will return to the presidency in Nicaragua. The conclusion is not hard to reach. The US is increasingly isolated. Regarding its combat against Muslim terrorism, it represents the last bastion of honor that in times past characterized Christendom. The Muslims see this very well. It is why they call the American soldiers crusaders. Unfortunately in the West only a few see it the same way. With this said, I will answer two recent accusations against the war being spread by the media. No one can deny that the political reality of Iraq is complicated and that it is difficult to peacefully install a government there. But this has nothing to do with the war or the United States. Iraq was artificially born from a decree by the League of Nations in 1920 after the Ottoman Empire was dismembered in World War I. The United Kingdom, which was given tutelage of the new country, set up an artificial king and managed the life of baby-Iraq until 1951, when a military coup-de-force took power. In turn, its leader General Qasin was deposed and shot in 1963 by a new military government. Its vice-president was Saddam Hussein, a Sunni and member of the Socialist Baath Party, which became the sole party in 1968. In the ‘70s Hussein’s power grew and in 1979 – through another coup-de-force – he took the presidency. You know the rest: invasion of Iran and the consequent Iraq-Iran war (1980-1988); invasion of Kuwait (1990) followed by the Gulf War (1991); brutal repression of rebellions by the Kurds (1974-1975, 1987-1988) and the Shiites (1991) by mass-murder. In short, the recent history of Iraq records two artificial regimes: a British-controlled monarchy followed by a dictatorship. Two provisory situations to hold together the heterogeneous peoples that live in the area demarcated as Iraq. I don’t know what inspired the League of Nations to set up a country with three different human groups that do not like each other: the Kurds in the north, the Sunnis in the center, and the Shiites in the south. What I know is that Iraq seems fated to engage in continuous internal strife among its three ethnic groups. One of the successes of the war was to topple the dictator. But, once accomplished, the old internal resentments and clashes rose to the surface. Let us see whether a “fairy Democracy” will have the magic power to calm the internal turbulence, as Mr. George Bush imagines, or if we should head to a solution similar to the one found for the former Yugoslavia, which was wisely divided into several smaller countries to pacify the incessant ethnic-political clashes among Croatians, Serbians, Bosnians, and Slovenes. Both the media and the political left are pulling out their hair and shedding crocodile tears about the number of causalities in the Iraqi war. Again, it is theatrics. Every genuine American is sorry for the number of soldiers killed in Iraq. The very families of those heroes, however, understand that their lives were the price the country pays to counter-attack the arrogance and imperialist goals of Islamic terrorism. 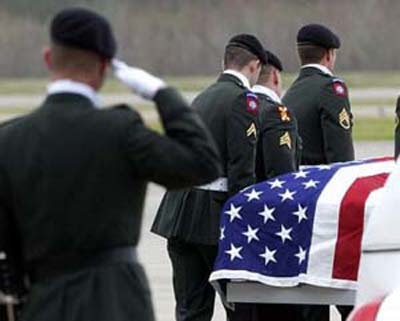 Notwithstanding the sorrow caused by the loss of loved ones, if you put the numbers in perspective – 2,215 causalities according to the report of the Department of Defense updated on January 13, 2006 – it is not a proportionally high number for a three-year-war. Who knows how many of those soldiers would have been killed had they remained in their homeland walking the streets of some large city in the US? The total homicides in these three cities during the three years of the Iraqi war was 4,657, more than twice the 2,215 causalities reported January 13, 2006 by the Department of Defense. By the way, the Police Departments of these three cities proudly report that the number of homicides these last three years dropped significantly compared to prior years. These numbers refer to just three cities… How many more Americans were murdered in all the US cities these last three years? What if we were to compare these hefty figures with the slender 2,215 deaths in Iraq? I do not understand how anyone of good sense can deny that the causalities index in this war has been notably small.